Improve conditioning, increase muscle development and propel your physique to new heights! While these moves may seem better suited for the playground, they’re actually beneficial to those of us a few years beyond playtime. So why not regress and play with plyometrics? It offers complete conditioning, improved power, increased muscular development, and is all but guaranteed to propel your physique to new heights. Begin with lightest medicine ball available – usually 2-4 pounds – and progress slowly to a heavier ball. If you do not have a training partner, use a solid wall or floor at which to throw the ball. Stand sideways to your partner with your knees slightly bent and your feet shoulder width apart. Hold the medicine ball with both hands at waist level directly in front of your body, and twist using your torso, hips and shoulders as far away from your partner as possible. From this wound-up position, forcefully uncoil, swinging the ball around and throwing it to your partner. Complete all reps on one side before switching to the other. Lie face-up with your knees slightly bent, your feet flat on the floor and your lower back arching naturally. Have a partner stand behind you and hold a medicine ball over your upper chest. Catch the ball as your partner drops it, absorbing its weight by bending through your elbows and wrists and lowering it slightly toward your chest. Push the ball back up immediately, throwing it straight up into the air to be caught by your partner. Stand facing your partner with your knees slightly bent and your feet spread shoulder width apart. Hold the medicine ball with your arms fully extended and your elbows slightly bent, and raise it above and slightly behind your head. Avoid arching your back and hyperextending your shoulders. From this position, contract through your abs, lats, triceps and shoulders and throw the ball forcefully toward your partner. Begin in the push-up position with your hands about shoulder width apart, your abs tight and your back flat. Lower your body to a point a few inches above the ground, then explode up and off the ground, clapping your hands in the air below your chest before catching yourself on landing with your hands in their original position. Immediately go into the next push-up and repeat, keeping the contact time with the ground to a minimum for optimal training effects. Begin your lower body plyometric conditioning with the least amount of sets and the maximal amount of rest. Minimise the time your feet are in contact with the ground between reps for maximal output. From a standing position, jump up as high as possible and use your abs and hip flexors to bring your knees up toward your chest as high as possible. Land with your knees soft, compress slightly, then immediately go into the next jump, keeping contact with the ground to a minimum. Stand on a 12-inch box, step or other stable surface, and step – don’t jump – off the box onto the ground, landing with both feet simultaneously. Compress and absorb the impact by bending through your knees and hips, then immediately spring upward into the air, jumping as high as possible and landing with your knees soft. Think of this as power skipping. With each bound on each side, exaggerate the motion with all parts of your body, brining your knee up as high as possible and swinging your arms as aggressively as possible to skip as high and as far as possible. Instead of going for reps here, you’re shooting for distance, so with each bound, leap upward and forward as far as possible until you move 20 yards. Stand with your knees slightly bent, and simultaneously jump and rotate 180 degrees to face the opposite direction. Land on both feet and compress as if you were going to jump again, but hold this position for a count of two before exploding and rotating to face your start direction. *Try to do these toward the beginning of the workout as they are particularly taxing. For the first two weeks, take time to learn the exercises, simply going through the motions of the exercises slowly and completely to get the hang of it. Do one set of each, leaving 2-3 days of rest in between for complete recovery. After those initial two weeks, begin powering up into maximal effort, keeping your sets to two and your reps to 3-4. As you improve and being to increase your output, you can increase your reps to six and your sets to three. Now shoot for the moon. Try to jump higher, throw further and cover more distance with each and every rep. you may regress to the 3-rep range for a while as your body again has to adapt to a stronger stimulus. But don’t be discouraged! It only gives you a higher standard to shoot for in the coming months. Leave at least two days of rest in between plyometric sessions to ensure full recovery, remembering that the more exercises you perform, the longer your recovery interval will be. If you choose to do plyometric more than twice a week, limit your exercises per session to 1-2 instead of 3-4 to ensure adequate recovery time. ALWAYS do a 5-10 minute dynamic warm up, such as biking, walking, jogging or skipping before beginning your plyometrics. STRETCH after the plyometrics and not before. “You’ll stretch out the elastic component in your muscles, reducing your capability for he maximal power output,” point out Kraemer. WAER athletic shoes with good lateral stability, proper arch support and a non-slip sole. TRAIN on forgiving surfaces such as a good shock-absorbing track, basketball court or grassy area. PROPER form is imperative. For lower body exercises, land softly on the balls of your feet, bending through the knees and hips to avoid injury. (If you hear smacking, slapping and general raucous noise coming from your foot area, you’re landing too hard!) When performing the upper body exercises, avoid hyperextending the shoulders and elbows, and focus on recruiting your core muscle (abs, lower back, and obliques) to add power. KNOW your limits and listen to your body. 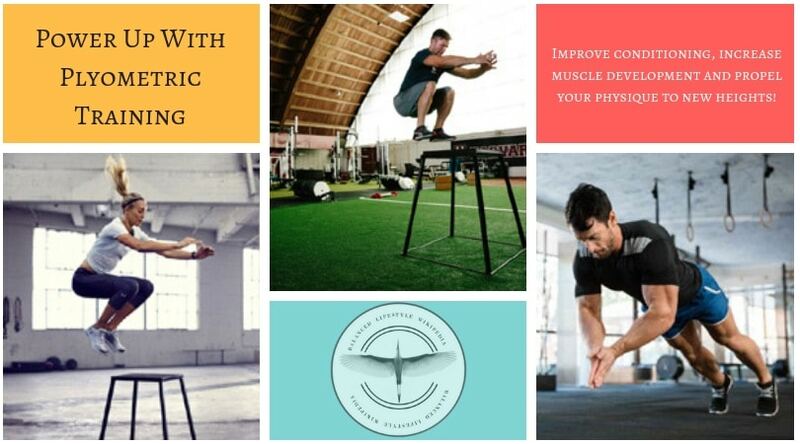 If you’re too sore or tired from heavy lifting session or a previous plyometric workout, forego additional plyometrics in favour of some cardio or light strength training until you feel less fatigued.